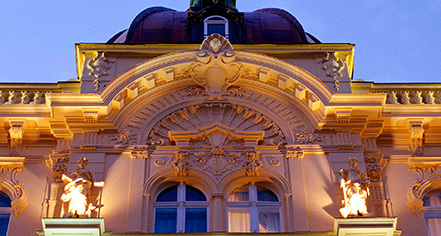 The Century Old Town Prague - MGallery by Sofitel, located just off Prague’s Old Town Square, dates back to 1894. The Neo-Baroque style building was designed by famous Prague architect, Alfons Wertmüller, who also created the Prague State Opera and the National Theatre. Neo-Baroque architecture or Baroque Revival is classified as an architecture that displays important qualities of Baroque style but is not from the 17th to 18th century. The building’s Neo-Baroque architectural details include ornate sculptural reliefs, bas reliefs, arched windows, and a large copper cupola. For most of its time, the building was used as offices of the Workers’ Accident Insurance Institute of the Kingdom of Bohemia, a government run insurer in Prague. Besides its detailed architectural beauty, the building is famous for its connection to illustrious Bohemian author and intellectual, Franz Kafka, best known for his short story “The Metamorphosis.” Between the years of 1908 and 1922, Kafka worked in the building as an insurance clerk at the offices of the Workers’ Accident Insurance Institute of the Kingdom of Bohemia. Kafka’s office was in room 214, which is now houses the hotel’s Kafka Suite. 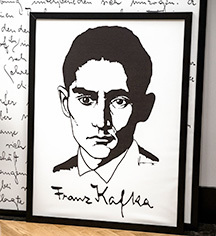 The work that Kafka did as an insurance clerk was very important to his career as a writer, and references to the Workers’ Accident Insurance Institute of Kingdom of Bohemia, his office, and his working life can be found throughout his literary works and personal diaries. Different themes of his work focus on obstacles of working, sick leave, and general culture within an office environment, all of which drew inspiration from his position in the Workers’ Accident Insurance Institute. In 2002, the building was turned into a hotel, and it became part of the MGallery by Sofitel collection in 2009. Recently in 2017, the hotel underwent a complete renovation. Designed by famous French interior designer Ana Moussinet, the hotel has made its own metamorphosis, all the while holding on to its historic architectural qualities and the stories of Franz Kafka. The newly redesigned hotel is heavily influenced by the 19th century Cubism art movement, as well as the Art Deco style. The hotel remains a must-see for those following the Kafka literary trail throughout Prague, as well as any who take an interest in history.